Have you ever shopped in Forever 21? I’m sure that’s a silly question, because at this point, probably everyone here has at least set foot in the store. There’s two scenarios that we all know that can happen to you when you walk into Forever 21. You walk in with a purpose, looking for the perfect basic, black skirt to go with that new top you got for your birthday. When you walk out, you’ve either got that black skirt PLUS four new tops, a few sweaters, a pair of jeans, and some platform sneakers, OR you leave with nothing at all because you couldn’t even begin to locate the skirt you were looking for in all of the disarray around you. It’s happened to you, too, right? Well… that’s also how I feel whenever I set foot in a used bookstore, although it’s usually the former scenario playing out at the end. I almost always have at least one book that I’m on the hunt for when I walk into the store. But as soon as I walk in the door, all bets are off, and it’s a free-for-all as far as what I might drop into my basket (yes, I pick up a shopping basket at the bookstore… better to be prepared). With the seemingly unlimited amount of choices in front of me, it can be hard to make decisions on what I actually want to buy, and so most of the time I end up literally judging books by their covers. 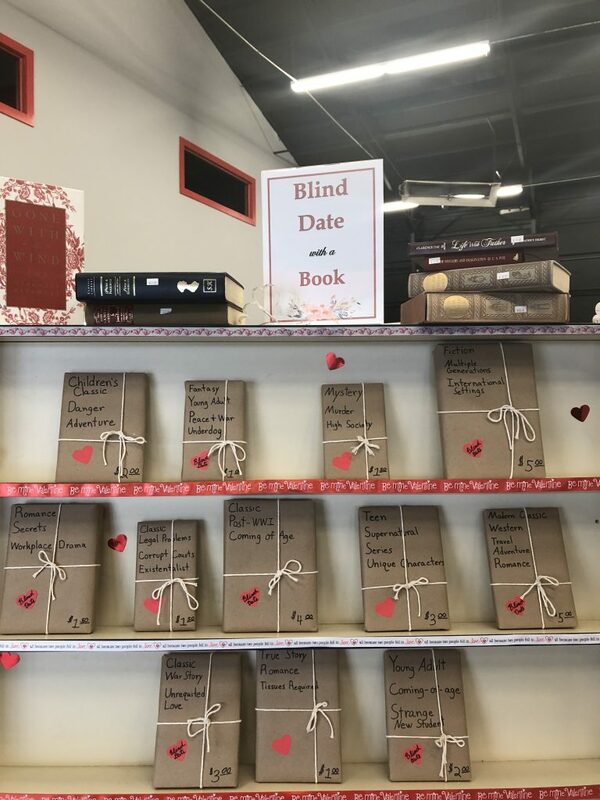 Which is why I absolutely adore this new (to me) concept that my local used bookstore employed this year for a Valentine’s special. 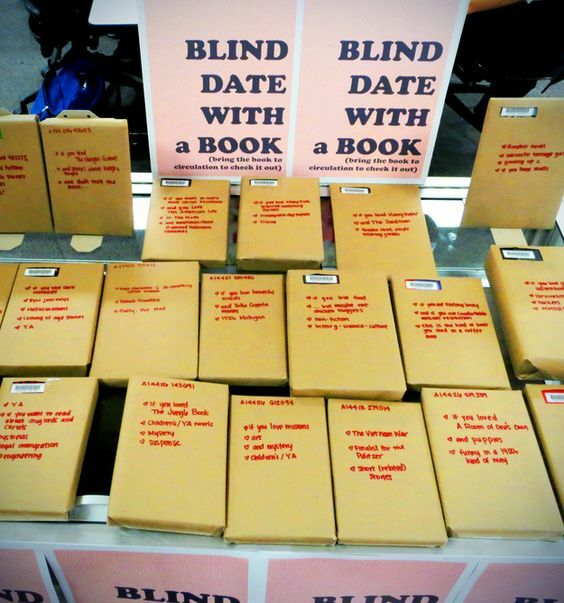 As soon as you walk in the door, you’re greeted with a big shelf boasting “Blind Date with a Book”. I was interested. On the shelves, they’ve stocked tons of books in different shapes and sizes, all wrapped in craft paper and tied with string. 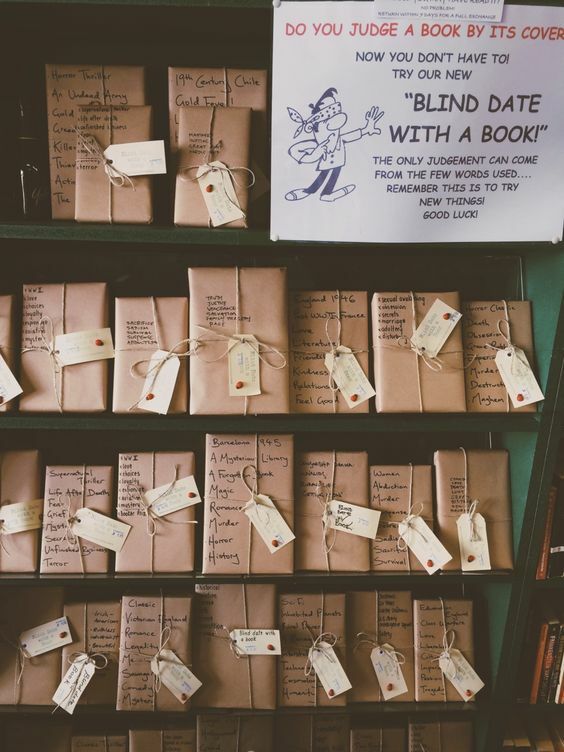 Each book is marked with three general facts about the genre and plot and then marked with the price. You can’t see the author or book title, you can’t flip through the pages or read the inside cover. You literally choose the book based off of the general description you’re given and hope for the best. You may love it, you may hate it, you may have already read it. But it’s the surprise of it all that makes it worthwhile! 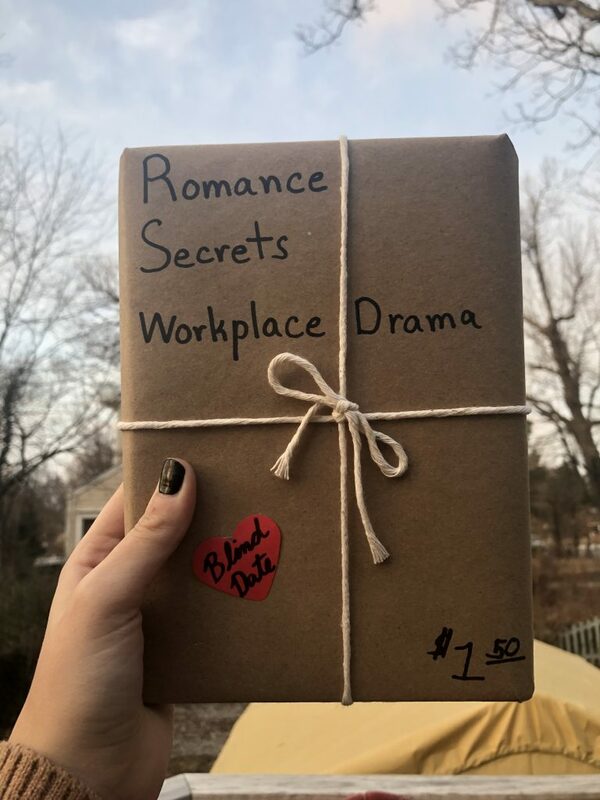 The concept is so fun and exciting to me that I, of course, picked one up with my best friend to open up this week on Valentine’s Day! I haven’t even taken a peek yet, so stay tuned to how it turns out! I’ll be sharing my big reveal (lol) on Instagram today! 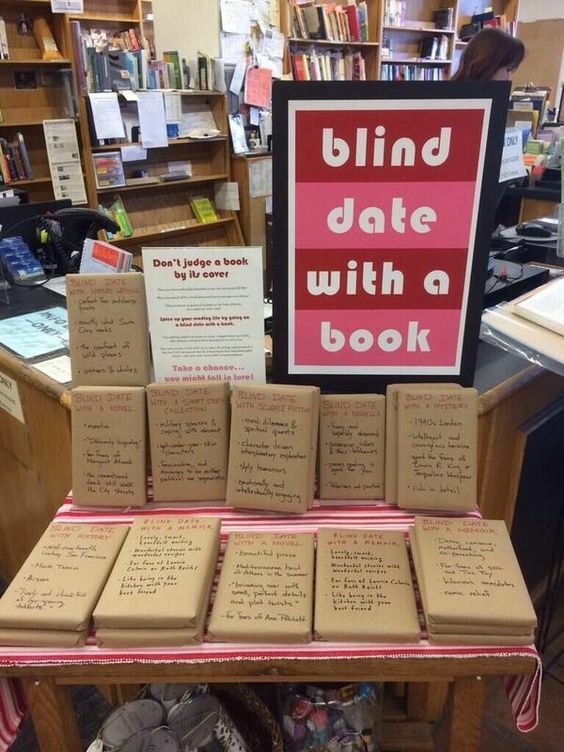 Until then, I want to know if your local bookstore does this same thing! If you’ve tried it, how was your experience? 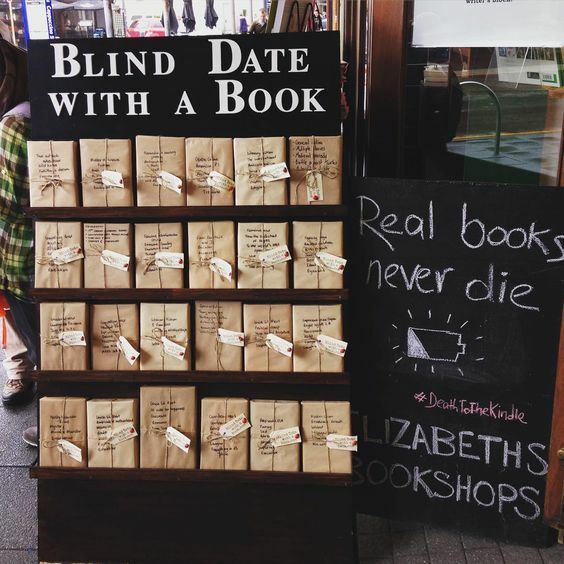 I hope our bookstore keeps it around past Valentine’s Day, because I think I might love this!